1. I was a competitive swimmer before I became a runner. I joined the cross country team my sophomore year of high school after my swim coach told me I was good but would never be great. 2. I gained the Freshman 20 in college and then I announcement my retirement from running. Then in 2007 Meb Keflezighi ran his first Falmouth Road Race. He sat at our table during the post-race party and asked me if I was a runner. 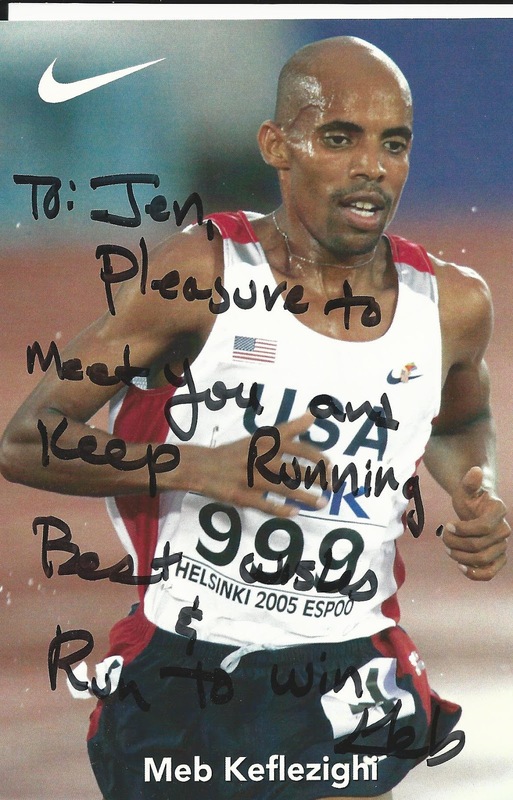 I told him I retired so he pulled out an autograph card and signed it with “keep running.” The next day I started running again. 3. Despite my job and active lifestyle, I can be the laziest person on this planet. I love my couch. It’s a great couch. 4. My favorite TV show is Parks and Rec. 6. I love a good burger post-long run. I’m addicted to ice cream. Gummy worms and powdered donettes are my weaknesses. 7. I am very competitive at board games. 8. I have always wanted to be on the Amazing Race. 9. I dreamed about having a dog my entire life. Georgie is my problem child pup but I couldn’t imagine life without her. She loves rocks and you can follow her craziness on Instagram @GeorgieGSD – she’s practically a celebrity! 10. Don’t ask me to use any tools to fix things but I find putting together IKEA furniture very therapeutic and rewarding. 11. I’m not what you would call a thrill seeker. Two of the scariest things I’ve ever done include sitting front row on Millennium Force at Cedar Point and riding the Niagara Jet Boats—both were with my cousin Melissa. 12. I have many fears including birds, butterflies, open water and ET. The ET ride at Universal Studios? Terrifying. 14. I also fear running out of toothpaste, deodorant and toilet paper so I keep a drawer full. 15. No adventure runs for this girl! I hate dirt, mud and being dirty. I have a bad trail running track record. I usually end up superman diving after tripping on a branch and one time I even fell in a thorn bush. 16. I do however love hiking and would hike the Niagara Gorge every day if I could. 17. At the Houston Marathon I got injured and ended up running 19 miles and walked 7.2 miles. I’m signed up for #3 in January for redemption! 18. If I can break 3:30 in the marathon, I’ll never sign up for another one ever again. I have a big goal of running a 1:30 half and I wanted to break 20 in the 5k—which I did at the 2015 Jingle Jog. 20. I live for football season. (WE ARE!) (#billsmafia) I am also a huge track nerd and love watching the three triple crown races with my dad. 21. I find any excuse to buy new sneakers. Running shoes, work shoes, gym shoes, casual. You name it, I got it—and in every color of the rainbow. 22. Birthdays are my favorite! I celebrate my birthday month. 23. I’d vote Fallon/Timberlake for President and I think Pharrell is the most gorgeous man in the world. 24. My travel bucket list includes: Paris in the spring, go on an African safari, explore National Parks out west and make a stop at Track Town USA. 25. I write some of my greatest blog posts in my head while I’m running. The problem is, I never remember them when I get home. Good luck with the redemption race! This post is very funny. 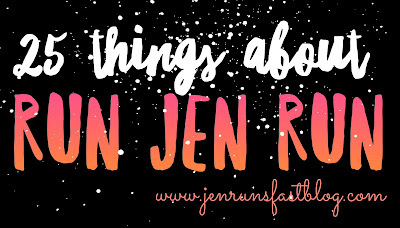 It is hard to imagine Jen lazy, eating icecream, laying around on the couch. I would love Timberlake as VP! Thanks for the peek into your surreal life. Thank you! I just got back from a run and the grocery store. It looks like its going to rain so I'm thinking I will plant myself on the couch for the remainder of the day haha :) Hope all is well - miss you guys. PS - #TimberlakeAndChill on Netflix 10/12. Can't wait!